That seemed like a good freeroll. and you had to finish in top two positions obviously. Did anyone managed to get one of the packages there? A site that we had quite long time to hear about. When i reg it was about 500 players, but late reg was more than hour. It was short stack tournament start with 300 chips. I had no luck becuse you can play just few hands. Now you know why there was no big turnout for a tournament where you would need to win a couple dozen coinflips to get through the first hour alone. Not too far from an all in game, in the first place. 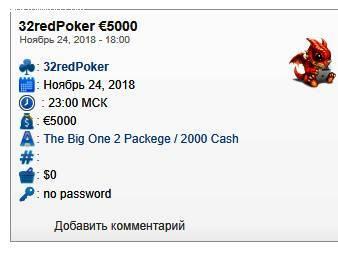 Thank you, peronibar, for letting us know about the special tournament at 32Red Poker. I tried to log into my 32Red account but failed. It seems my account is being considered inactive and dormant. 32Red support told me that I would need to talk to one of their support representatives over the phone to finalize the account reinstatement process. Seriously? Do they know how much it costs to make international phone calls?